After the fall of the Empire and Qing dynasty in 1912, the first Chinese Republic was born. Sun Yat-sen was its first president, but he was forced to give way to the former dynasty army general, Yuan Shikai. After the troubled Era of the Warlords, Sun protégé, Chiang Kai-shek, formed the Kuomintang in the south, rallying most of south and central China in the 1926–1927 campaign. By 1934, the opposing force, the Communist Party of China, took refuge in the mountains. After being driven out, the Chinese Soviet Republic started its famous “long march” to the northwest, establishing a guerilla base at Yan’an in the Shaanxi Province around their new leader, Mao Zedong. From 1931 on, these two forces would collide until a formal agreement was established in order to try to repel the Japanese Invasion started at Shanghai. The Sino-Japanese War ended in 1945, and the old rivalry bewteen Chiang Kai-shek’s Kuomintag and the Communist movement led by Mao reappeared. At the start of the war with Japan in 1937, the Nationalists led by Chiang Kai-shek had support from the European powers and especially Germany, which sold them various military equipment and weapons, including some armored cars. However, the bulk of Chinese armor consisted of L3 tankettes purchased from Italy, along with a few amphibious Vickers tankettes and a few Vickers 6-ton tanks. This was not sufficient against the Japanese. With World War Two erupting, the relations were reversed due to the German-Japanese alliance. Little support could be given except for a single American squadron (Chennault’s famous Flying Tigers) until Pearl Harbor changed it all. After this point, American support to the Nationalist side began to weigh heavily. By 1944, the Nationalist forces were well equipped with M5 Stuart and M4 Sherman tanks, whereas the CPC gradually started receiving some military help by USSR. The bloody civil war which resulted after the Japanese surrender ended in 1949 with a total victory for the CPC. The Nationalists were driven back to a few islands around Taipei (Taiwan), which consolidated into the Republic of China, in opposition to the People’s Republic of China on the mainland. 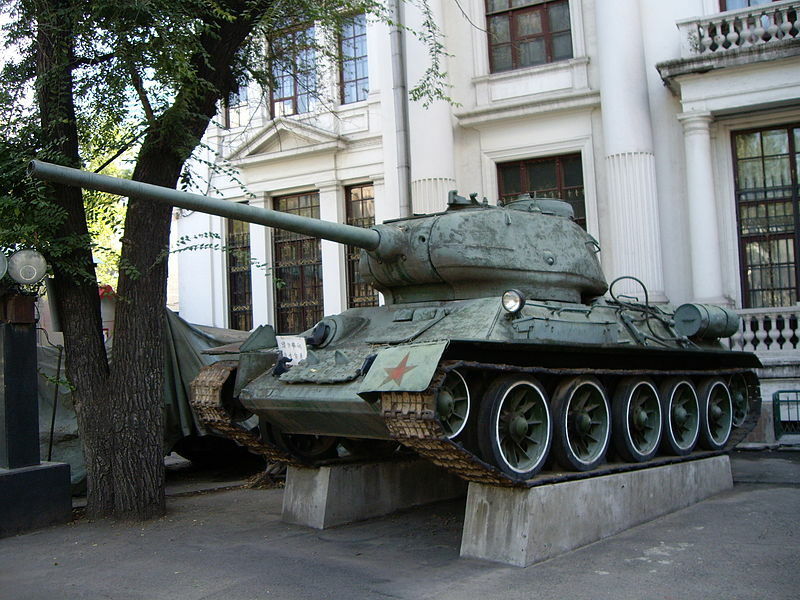 Tanks used by the PRC included the Gongchen (a Type 97 Chi-Ha), T-34/85s, IS-2 heavy tanks, and some captured vehicles. The People’s Liberation Army was founded in August 1927, during the Nanking Uprising. It fought off against several expeditions by the Kuomintang and also fought against the Japanese. Thus, in 1949, when China fell entirely under the control of the PRC, the army had long years of experience, both against the Nationalists and the Japanese. By 1949, the army was reorganized into three branches, the People’s Liberation Army Ground Force (PLAGF), Navy and Air Force. The bulk of the tank forces and armored divisions is ensured by a core of professional volunteers, while the infantry consists of conscripts, as military service is compulsory. In the case of a national emergency, these forces would be supplemented by the People’s Armed Police and the People’s Liberation Army Militia acting as a reserve. The military age is between 18 and 49 years and both men and women are considered fit for military service. This gives a total of 385 million men and 363 million women able to be called under arms. The military budget as a whole is about 1.4% (2014 est.) of the GDP. The Norinco Corporation (China North Industries Corporation) is now the leading Chinese supplier of tanks and armored vehicles but also focuses on small arms. The bulk of the production facilities is located at the Inner-Mongolia First Machine Group Company Limited since the 1950s. These facilities started with Soviet-supplied parts and equipment, with the goal of building the first proper Chinese tank, the Type 58. None were built, however. In order to have access to better tanks, the Sino-Soviet Treaty of Friendship and military alliance was signed in 1956. With it, a factory was built in Mongolia, Factory 617/Baotou Tank Plant, later known as the Inner-Mongolia First Machine Group Company Limited. The complex was a copy of a manufacturing plant producing the T-54. This complex delivered the Type 59, by far the most produced Chinese tank up to this point. 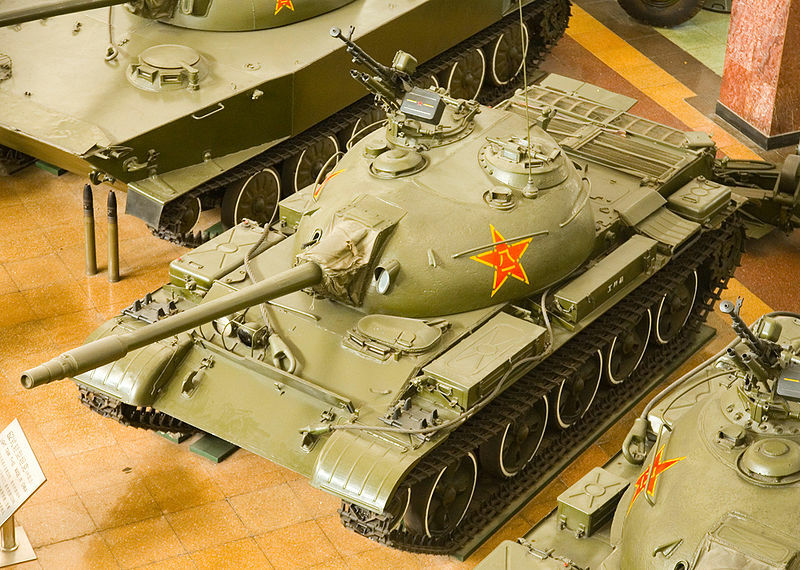 The Type 59 not only formed the backbone of Chinese armored divisions until the 1980s, but was also the basis upon which virtually all other Chinese tanks were designed. These include the light Type 62, the Type 69 and 79, and even the Type 80, 85 and 88. This reliance on the T-54A and not the newer Soviet MBTs built in the meantime, like the T-62, T-64 and T-72, was due to the severing of relations with the Soviet Union in the 1960s. This not only meant that China was cutoff from Soviet tank improvements, but it also had to, in the long run, rely more extensively on Western technology, ending with the strange mix of Soviet and Western designs which characterize the Type 90, 98 and 99. The Soviet Union gave China 1,837 T-34/85 tanks, which also served with the North Koreans during the Korean War. The 1954 Operations Research Office report of “Tank v Tank Combat in Korea” stated that there had been 119 tanks duels in the Korean War, including 38 US tanks lost against T-34s (some were repaired afterward). 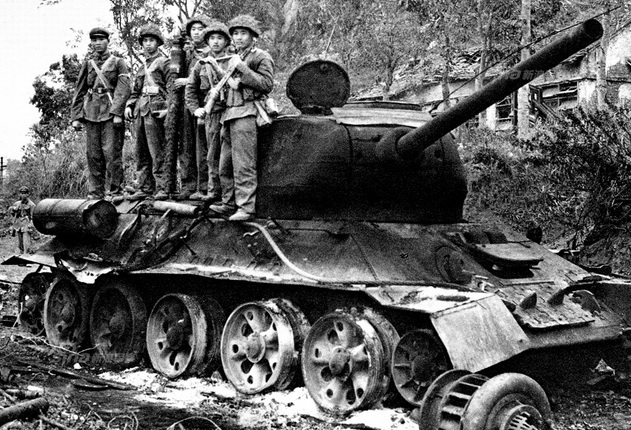 The Chinese records allegedly claimed a number of US tanks later in the war, at a time when the bulk of the North Korean T-34s (over 400 estimated) had already been lost by November 1950. In any case, records of Chinese Type 58 tanks operating in Korea have been confirmed. It should be also noted that North Korean forces operated SU-76 self-propelled guns, which were highly useful as the mountainous terrain that hosted most of the engagements was not fit for large tank assaults. The job was done by mortars, artillery, and infantry, for which the tanks only served as a support, dealing with fortified positions, a task they were not fit for due to their relatively small-caliber hard-hitting rounds rather than High Explosive ones. After the war, a Sino-Soviet agreement saw the construction of a large manufacturing complex to deliver a copy of the T-54A which became until the 2000s, Chinese reference MBT. 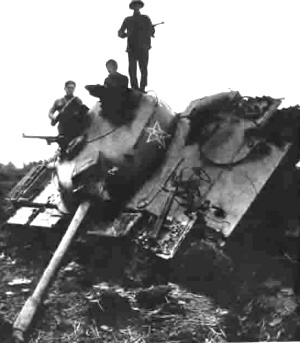 Destroyed Chinese T-34/85, Korean War. This fast clash of Asian titans lasted between 20 October and 21 November 1962 but was quite intense. Set on the Himalayan border, this conflict had deep and complex roots, including the 1959 Tibetan revolt, in which India had granted asylum to the Dalai Lama, and the erection of a line of defensive works to the north of the McMahon Line, a territory claimed by 1st Chinese minister Zhou Enlai in 1959. Unable to reach an agreement, Chinese PLA forces launched an all-out offensive against Indian positions along the Mac Mahon line, but concentrating on Ladakh. The Air Force took no part in it, due to the altitude and bad weather. There are no accounts of any armored vehicles being involved on either side due to the nature of the terrain, but SPGs were employed for support. Despite heavy losses on both sides and hazardous claims, China mostly secured its objectives and took de facto control of the Aksai Chin. Distrust seeped into Sino-Soviet relations, eventually leading to a major fracture in the Communist world, as well as a swapping of alliances (which was more obvious after Deng Xiaoping’s visit to the USA 1979). This seven-month undeclared military conflict erupted on the border between the two countries at the height of the Sino-Soviet split. It concentrated on the disputed areas near the Argun and Amur rivers and saw at least one tank engagement. On March 2, 1969, PLA’s troops ambushed a Soviet border guard unit on Zhenbao Island. 59 soldiers were killed dead and, on March 15, the Soviet commander ordered a retaliatory artillery strike on a Chinese troop concentration while Zhenbao Island was re-taken. Afterward, four of the brand new T-62 MBTs were sent to deal with Chinese patrols on the island. However, one of these vehicles was hit and never recovered due to accurate Chinese artillery fire. It was captured afterwards and proved instrumental in allowing the Chinese to reverse-engineer the latest Soviet technology and devise the next generation of MBTs, the Type 69/79. A part of the “Third Indochina war”, this obscure border conflict lasted from February 17 to March 16, 1979. The roots of the conflict can be found in the Soviet Union and Vietnam twenty-five year mutual defense treaty, the war against the Khmer Rouge of Cambodia, alleged mistreatment of Vietnam minorities and the Spratly Islands claimed by China. This time, the Chinese fielded a massive force of some 200,000 PLA infantry well supported by some 400-550 tanks. Opposing them were 70,000–100,000 regular Vietnamese force and some 150,000 local troops and militia. The terrain, again, was mountainous and difficult for tanks. The Chinese losses due to RPGs were massive. The first assault on February, 17, saw 200 Type 59, Type 62, and Type 63 tanks engaged in support of the infantry divisions. 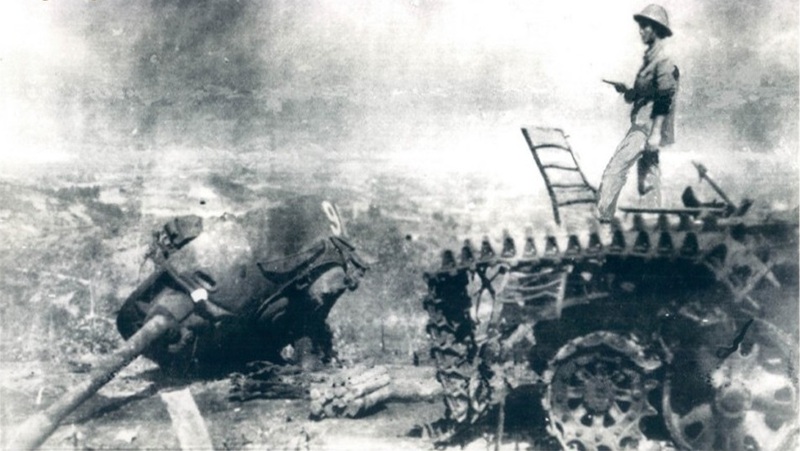 A pincer movement was launched, towards the west, aimed at Cao Bang, Lang Son and Quang Ninh Provinces, and the east, towards Ha Tuyen, Hoang Lien Son and Lai Chau Provinces. Type 62 destroyed at Cao Bang. All Vietnamese forces from Cambodia, southern Vietnam and central Vietnam were deployed to the northern border while the USSR provided intelligence and equipment support. The Soviet Pacific Fleet provided battlefield communication relays. What followed were the First Battle of Lang Son, Battle of Dong Dang, Battle of Lao Cai and Battle of Cao Bang, which saw the Vietnamese inflicting massive casualties on the attacking Chinese. Depending on the sources, Chinese casualties ranged from 9,000 (Chinese claim) to 62,500 plus 550 military vehicles and 115 artillery pieces destroyed (Vietnam claim) while about 117 000 Vietnamese troops and militias were claimed by the Chinese plus 10,000 civilians. In the aftermath, not only did Vietnam consider the war a clear-cut victory against an invader, but this also allowed the Soviets to continue backing the Vietnamese in a war to defeat Pol Pot in Cambodia, ending a tragic genocide. The war was not over, with border skirmishes erupting throughout the 1980s, starting with the Shelling of Cao Bằng, the 1981 Battle of Mẫu Sơn, and the 1984 Battle of Vị Xuyên. Border shellings were discontinued until 1988 but an uneasy ceasefire and border pact were ultimately signed in 1999. The Type 58 is often claimed to be the first Chinese-built tank, a simple copy of the Soviet T-34/85. However, all the Type 58s used by the PLA were Soviet-built. It is highly possible that the Chinese did indeed plan to build a copy of the T-34/85, but switched to the Type 59 instead. The Type 58s received several upgrades that make them distinctive. 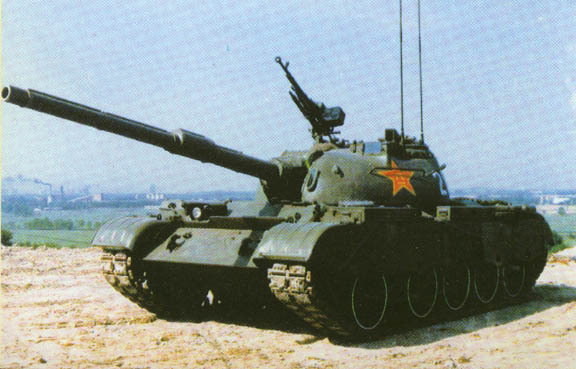 The Type 59 was the most numerous Chinese battle tank, at least until the 1990s. 9500 units were produced, modernized in several series, from the I to the II and IIA. The lastest versions are still in service today. The main change involved the replacement of the original Soviet-copied 100 mm (3.94 in) gun with a British-licenced version of the L7 gun. The Type 59 was basically a copy of the T-54A, produced with Soviet help just before the relations with the USSR were severed. This model was also largely exported. Unable to gain access to the technology of the latest Soviet tanks, like the T-62, the next generation of medium tanks nevertheless went ahead with the Type 69, falsely assimilated by some experts as a copy of the T-55. The Type 69 is frequently assimilated to the Type 79 and often the three types are mismatched. The Type 69 was designed from 1963 to 1974 by the No. 60 Research Institute to be an all-improved version of the Type 59, with a dual-axis stabilized 100 mm smoothbore gun, a new 580 hp engine and an IR search light, among other changes. However, in 1969, during the Sino-Soviet border conflict, a T-62 was captured, and served as a basis for a new wave of improvements. 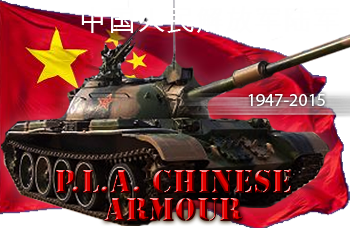 Therefore, the new tank was the first completely developed in China, although still with many Soviet-origin technologies, adapted to the Chinese needs. The Type 79 was a new version following the adoption of many western technologies. The first was mostly exported abroad. Both are still in service today, despite the arrival of new, improved models. 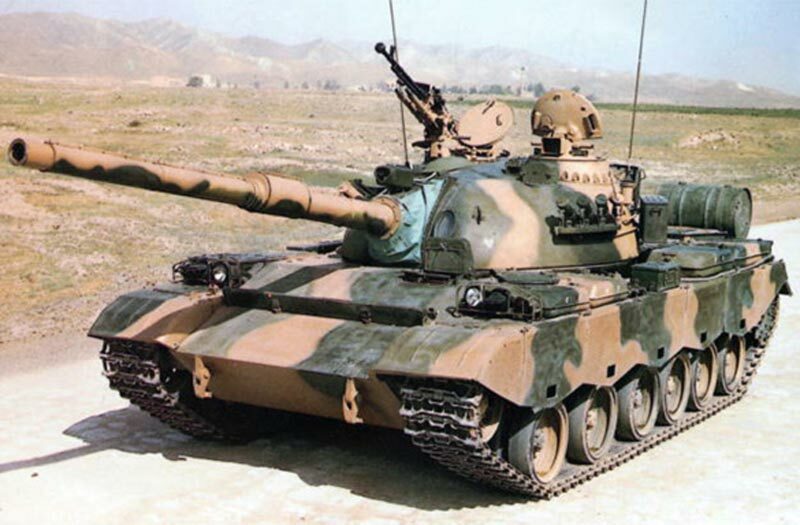 The Type 80 was the last T-54/55 inspired tank, based on the Type 79 but with even more Western technology due to the better relations with the West. The Type 69 officially failed to satisfy the Chinese requirements, so 617 Factory (now Inner-Mongolia First Machinery Group Company Ltd) was put in charge of integrating a new chassis with new wheel/track systems and reworked suspensions, an all welded turret, increased protection, a much more modern German 730 hp 1215OL-7BW diesel engine, a dual-axis stabilized light spot FCS and external laser rangefinder, with a Type 83 105 mm rifled gun, NATO-standard, licensed from Austria. 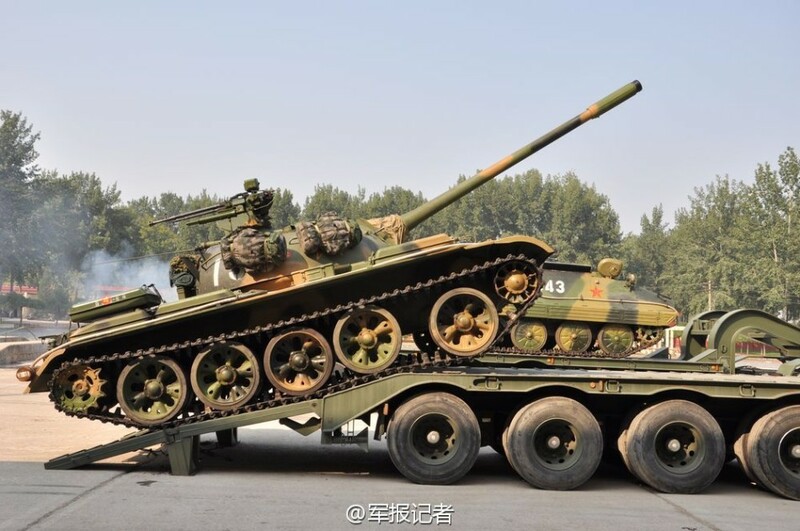 The Type 85 was built by Norinco most likely in association with the 201 Institute (now China North Vehicle Research Institute), and inspired by the T-72 as a few ex-Iraqi ones captured by Iran were purchased by China for examination. It was the first second generation Chinese tank, but still not satisfactory, not only compared to the T-72 but also most western tanks. Around 900 were built. The Type 88 was an attempt to radically upgrade the Type 80. It was created by the association of China’s 617 Factory (main contractor), 616 Factory, 477 Factory, and 201 Institute. It was still technically an offspring of the Type 80, however protection was heavily upgraded. It entered service in 1988, and production was stopped in 1995 after 400 to 500 were built. The Type 62 was basically a much lightened Type 59 used as a light tank for the Himalayan ranges. About 1500+ were produced in the 1960s. The Type 62 was also exported to Asia and Africa. Most have been modernized as the Type 62-I and Type 62G and withdrawn from service. A virtual copy of the Soviet PT-76, but with the turret from the Type 62. It was the main amphibious tank in service, superseded by the larger Type 63A in the 1990s. The main Chinese IFV, derived from the Soviet BMP-1. Many were exported and several variants were also produced. China produced an estimated 3,000+ Type 86s. About 1,000 were enlisted as of 2009. 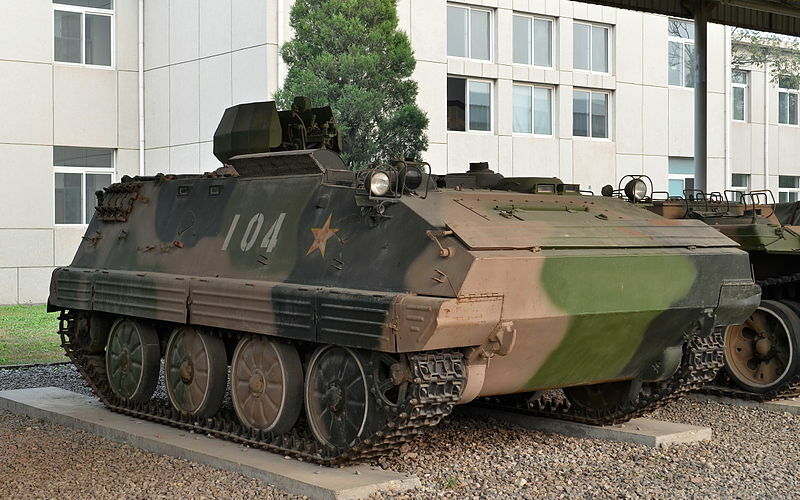 The first tracked APC designed in China that saw mass production (perhaps over 8,000 built including exports) from the 1960s to the 1980s. It was declined into 19 variants and was armed, as standard, with the Type 54 12.7 mm (0.5 in) heavy machine gun. Criticized in the west (some were captured after the 1990 Iraq war), it showed poor ballistic protection due to dubious steel quality, but also a cramped troop compartment, low power-to-weight ratio, no NBC protection, no rear ramp, no anti-slip roof surfaces, nor inner spall-lining. It was nevertheless an export success due to its fairly low price. Making good use of the Type 63 amphibious tank chassis, this Marine APC was not a copy of the BTR-50. Hí. Is the year correct. One should be wrong. The first one was wrong. It has been corrected. So approx 1 billion women to every man? I gotta head to China soon! The first photo in think is wrong. The tank what on the photo isn’t Type 59, it Type 62 light tank. Can you precise the link of the image, please ? The Type 62 have double row track teeth while Type 59 have single only(Such as Soviet’s T-54). And Type 62’s gun barrel is obviously different from Type 59’s too. This is the best I’ve ever seen about tanks website, this is a great job. and where is 7.62cm Pak 36 (r) Auf 5t Zugkraftwagen Sd Kfz.6/3? That’s a difficult subject however. The 7.62cm Pak 36 (r) Auf 5t Zugkraftwagen Sd Kfz.6/3 is one of the models planned for schedule, based on this half-tracked which will go to the ww2 vehicles section. They will come in time. The Type 64 is part of the ROCA future page, completely separated from this one. We just did a survey and list of all models, starting with the 1930s. 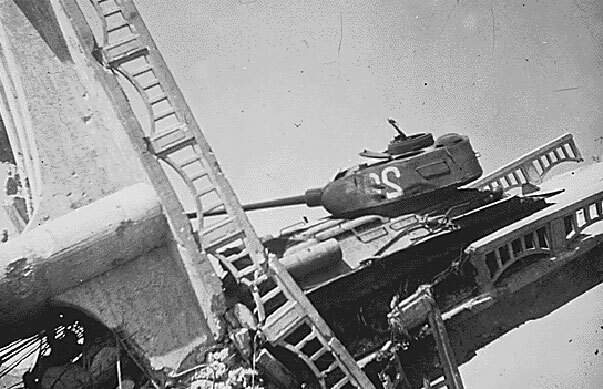 Wait… I think the Destroyed Chinese T-34/85, Korean War picture is the same as the Wrecked North Korean T-34/85 shot at the bridge south of Suwon (Korean war) You mind taking a look. how about wz 1224 ? Nice page. However some suggests that the type 58 was not simply a T34-85, this designation only refers to a small number of modified T34-85’s with additions like loader’s cupola, turret-top machine guns mount and V-shape armor plate on turret roof, etc. The type 58’s were actually built in China, those T34-85’s received from the soviet were not under the designation. As for the picture at Lang Son I believe it was a Vietnamese T34-85 destroyed by the PLA, with PLA soldiers standing on it (type 74 uniforms, type 56 AKs and chest-rigs). The tank in the picture lacked any external trait of a type 58 (eg. cupola), and it was quite certain that no Chinese T34-85 or type 58 were operated by the PLA during the ’79 conflict. It’s actually a Vietnamese T34-85 destroyed by the PLA. 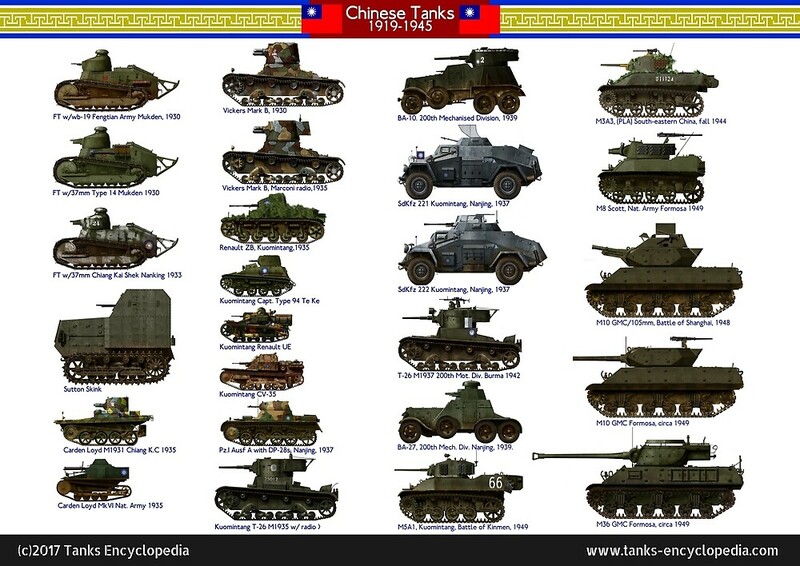 As seen that there’s not a distinct page for Taiwan (or the Republic of China), would there be any chance to include Taiwanese tanks used in the taiwan era of the ROC in this page? 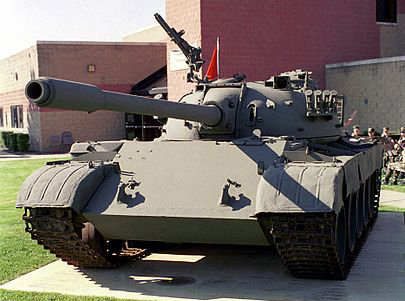 They have some interesting variants of American tanks in service as well. I’m sorry,there is not any PLA organnization called “8th Army”. only several “army corp”s tool part in the 1979 war,like the 43rd,54th and other corps. 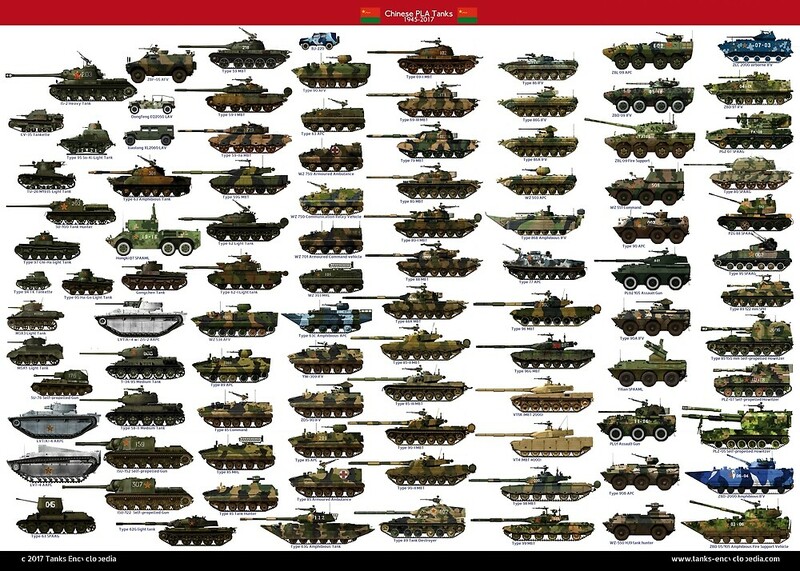 I love tanks , amazing website.